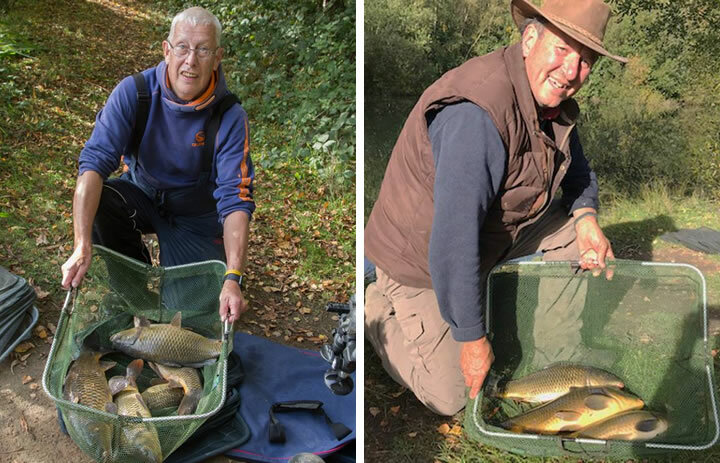 The final leg of the Milliard Trophy was fished at the Granary and was a silverfish/ carp match – separate silverfish and carp matches are fished and the points from each combined for the final result. The interesting thing with this style of match is when do you switch from fishing for carp to fishing for rudd/ perch. The silverfish switched off for the latter part of the match so any angler leaving it until then really struggled to catch them. The temperature had increased during the previous week but had dropped on Saturday with an overnight temperature of 8 degrees. However on Sunday morning we were greeted with a dry day with clear sky’s and sunshine. However due to the orientation of the lake one set of anglers were in sunshine and warmth and the others in the shade and colder. In first place was Mick Greenway, fishing the last peg on the golf course side caught 5 carp weighing 20-15-0. One was caught on a hybrid feeder and the other four on the pole fishing either paste or meat. Second place was taken by Steve Pentecost fishing on the other side of the lake at the far end of the island. His 3 carp weighed 13-7-0 and were caught on a feeder fished towards the island. First place was taken by Mick Greenway who fished for silverfish in the second hour using the top kit from his pole and maggot as bait. He caught some good quality rudd and a single perch with a total catch of 4-7-8. Vince Herringshaw used his trusty whip to catch 2-13-0 of rudd. He caught a lot of fish but they were all small. Overall Mick Greenway won the match with 20 points from Steve Pentecost with 16 points. After two legs Mick Greenway won the Milliard Trophy with 20 points from Keith Hughes with 14 points.